Is this another points-based system, like the High Five Contest? Or is quality > quantity? Is it pronounced ku-zee or coe-zee? I've heard it both ways, but the former just sounds dirty. Do you hate Aqua Teen, Jesse? I'm getting that vibe. I will pick one from the entries, probably randomly unless one really inspires me. I totally like Aqua Teen. Not my favorite show in the world, but I really like it. I just can't imagine what the movie will be. 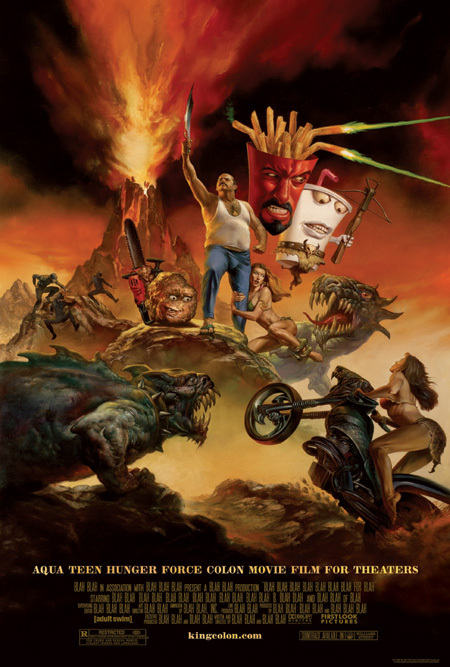 I won a Master Shake car air freshener from Cartoon Network when the show 1st premiered, I've never used it and apparently it's become very rare.I know the movie has been getting some disastrous reviews even from fans, but that is one outstanding poster. Koozie - the thing that you put around cans of pop/soft drinks to keep your hand from getting cold. and to keep your beer from getting warm.Its like something your dad would use at a neighborhood cook out. I have heard horrible, horrible things about the film. The usually amenable Jerry Beck of Cartoon Brew ripped it a new one a couple weeks ago. "koozie" is to foam beverage insulator in the same way that "kleenex" is to facial tissue or "coke" is to sweetened carbonated beverage depending on what part of the country you live in. brand name to used to designate a generic product. When will these results be announced? !